The dream to own a home in Delhi NCR is now possible. Smart City Dwarka is here with an amazing project in Dwarka, L Zone, Near Dwarka and in NCR. People are entitled to the finest services when they are in their business / service period by the government or in private sector but once they retire most of their dreams of to own a home in Delhi NCR goes haywire. Due to the sky-rocketing prices, this dream completely fades. To give due respect to their services, Smart City Dwarka is here to provide them with quality housing with all the necessary facilities and that too at affordable rates. This township sports the top- notch facilities that you have always dreamed. The projects are designed under the Master Plan of Delhi 2021, Smart City Mission and Housing for All with the help of the latest technologies. It’s not just an address, but is home to millions. Smart City Dwarka offers 1/2/3/4 BHK apartments so that you choose the best at affordable price. Smart City Dwarka has got everything you need in societies including high-speed net connectivity, 24X7 water supply, uninterrupted power supply and three tier security system. Moreover, you can enjoy life to the fullest with top facilities such as gymnasium, badminton & tennis court, swimming pool, club house facility, multipurpose hall, yoga area and meditation area. Apart from separate swimming pool for kids, jogging tracks, kids play area and amphitheatre are also included in the project. Luxury AmenitiesLocation Advantage.Society Flats . Builder Floors.Luxury facilities with Affordable Pricing.Smart City mission & Housing for All. 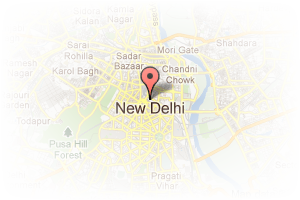 Address: Near Sector 24, Dwarka, Dwarka L-Zone, New Delhi, Delhi, India. This Broker Profile page for "Vatsin Enterprises" has been created by PropertyWala.com. 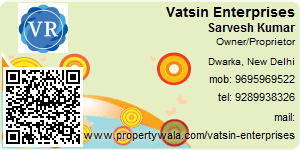 "Vatsin Enterprises" is not endorsed by or affiliated with PropertyWala.com. For questions regarding Broker Profiles on PropertyWala.com please contact us.